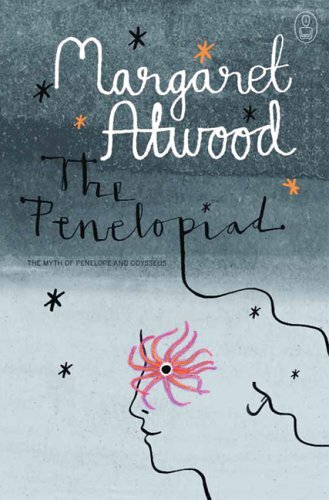 I read The Penelopiad by Margaret Atwood one afternoon while Littlest slept. It's only little. In this novella, Atwood would like us to see the world from Penelope's eyes. And not just during the 20 years that Odysseus was away fighting in the Trojan War and his adventures afterwards. Her upbringing, her relationship with her cousin, Helen of Troy, the early years of her marriage, all are discussed in this small book. I have read Homer's Iliad and Odyssey, but many years ago and only have a dim recollection of the stories. I think a better understanding of The Odyssey in particular would help any readers of The Penelopiad. Either way, I really felt for Penelope after reading this book. She comes across in Homer's epic tales as a faithful and virtuous woman and not much else. Atwood gives her a personality, a voice. She lets us into Penelope's head as she struggles with the isolation of being left behind. While most of the novel is concerned with Penelope's story, we also hear briefly of the twelve maids who are kiled along with the suitors by Odysseus and Telemachus when Odysseus finally returns. Atwood uses the maids as a modern day chorus - telling their stories in songs, poems, a court-room drama and an anthropology lecture. While I did find some parts of the novel to be funny and interesting I felt like it also disrupted from the story and at the end I didn't feel a strong emotional connection to any of the characters or the story. Having only ever read Margaret Atwood's dystopic novels (The Handmaid's Tale, Oryx and Crake and The Year of the Flood) I found The Penelopiad to be slightly disappointing. It was light and fun read but perhaps if it were longer I'd have enjoyed it more. I just love the cover! I have yet to read a book by Margaret Atwood, I do own The Handmaid's Tale, so hope to read it soon. I didn't realise her books were dystopian ones, now you know I love a good dystopian novel. I just stumbled across your blog, and I'm already a fan. As a bibliophile myself, I enjoy hearing what books other people have to suggest. I've heard good things about Margaret Atwood. This sounds interesting, although I think I'll take your suggestion and try to get an understanding of The Iliad and The Odyssey first.